Pound cake has got to be one of my all-time favourite cakes/desserts/snacks. It’s so plain and simple, but that’s precisely why I like it. It’s not too sweet and can be eaten anytime of the day. I especially love a slice (or two!) with black coffee. It shouldn’t come as a surprise then, that I’m constantly on the lookout for the best pound cake recipe. I’ve come across many cake recipes using sour cream and cream cheese, but not whipping cream. I decided I had to try it for myself. We all know about Elvis Presley’s love of fried peanut butter and banana sandwiches…but pound cake? Well, not just any pound cake. Apparently one of his favourite sweet treats was the pound cake made by his childhood friend, Janelle McComb. 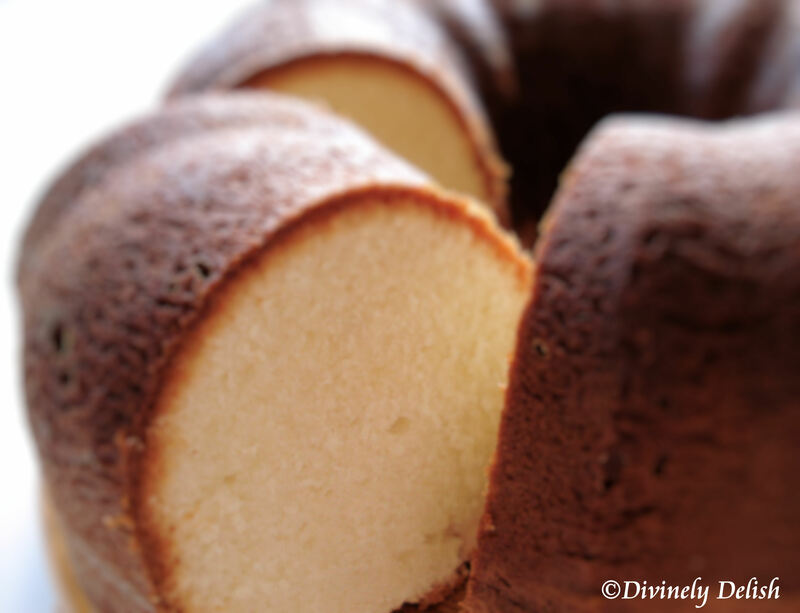 This cake is so deliciously soft and moist that it’s almost slightly sponge cake-like. Personally, I prefer a pound cake that’s much more dense and buttery. But don’t get me wrong – this is definitely a great tasting cake with a nice tender texture. It’s good on its own, and I also think it would make a wonderful base for decorated cakes. 1) Put oven rack in middle position, but do not preheat oven. 2) Generously butter pan and dust with flour, knocking out excess flour. 3) Sift together sifted flour (3 cups) and salt into a bowl. Repeat sifting into another bowl (flour will have been sifted 3 times in total). 4) Beat together butter (2 sticks) and sugar in a large bowl with an electric mixer at medium-high speed until pale and fluffy – about 5 minutes in a stand mixer fitted with paddle attachment, or 6 to 8 minutes with a handheld mixer. 5) Add eggs 1 at a time, beating well after each addition, then beat in vanilla. 6) Reduce speed to low and add half of flour, then all of cream, then remaining flour, mixing well after each addition. 7) Scrape down side of bowl, then beat at medium-high speed 5 minutes. Batter will become creamier and satiny. 8) Spoon batter into pan and rap pan against work surface once or twice to eliminate air bubbles. 9) Place pan in (cold) oven and turn oven temperature to 350°F. Bake until golden and a wooden pick or skewer inserted in middle of cake comes out with a few crumbs adhering – 1 to 1 1/4 hours. 10) Cool cake in pan on a rack 30 minutes. Run a thin knife around inner and outer edges of cake, then invert rack over pan and invert cake onto rack to cool completely. Cooks’ note: Cake keeps, covered well with plastic wrap or in an airtight container, at room temperature 5 days.